Once again I’m late getting this post up. 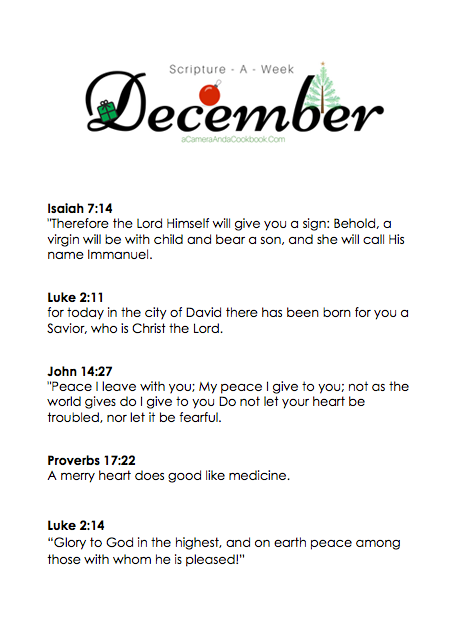 So now that its December, here is your December Scripture-A-Week. I have been so busy the last month that I never got to share with you about why I’m so busy. Instead of continuing to say I’ll share it in another post, I’m just going to share it briefly here. I got a new job… It’s actually in the same department that I’m in, but it’s a promotion. It’s a lot more stress, but a lot more job satisfaction. And right now I’m doing 2 jobs, my old job and my new job. I pray that they allow us to fill my old job, because well…that’s just not right. For our December scriptures, I decided I would pull several that have to do with Christmas and the birth of Christ. As always I hope they are a blessing to you. I hope your Christmas season is full of love, laughter, forgiveness, and peace. “Therefore the Lord Himself will give you a sign: Behold, a virgin will be with child and bear a son, and she will call His name Immanuel. “Peace I leave with you; My peace I give to you; not as the world gives do I give to you Do not let your heart be troubled, nor let it be fearful.